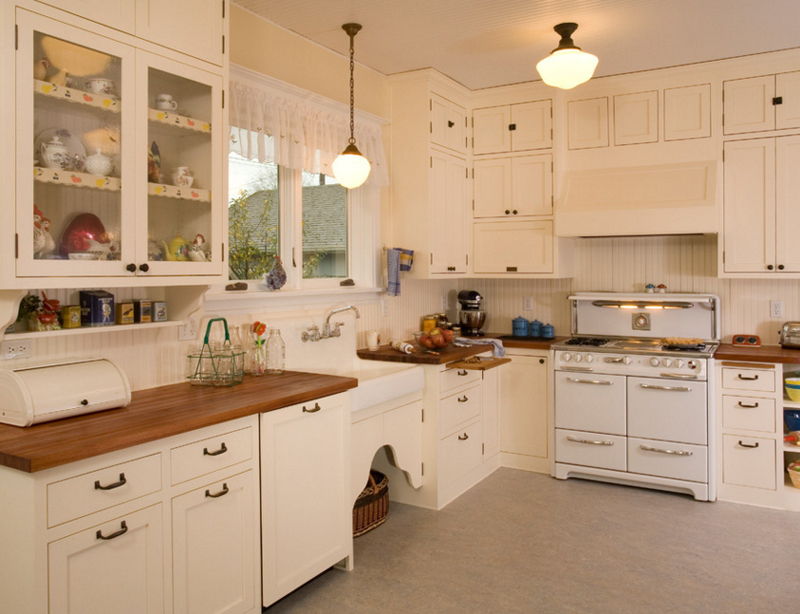 Want to add a vintage twist to your kitchen? How about some lights over your table? You might be charmed with all the beautiful and modern looking lamps that are available in the market today; but time and time again, vintage things surprise us. Vintage design has always been a favorite for most designers because it has always been the beginning of all that is today when it comes to design. Vintage design has been coming back and basically has never left the cabinets of our malls and supermarkets and even those small boutiques with those small vintage trinkets that will never go out of style. 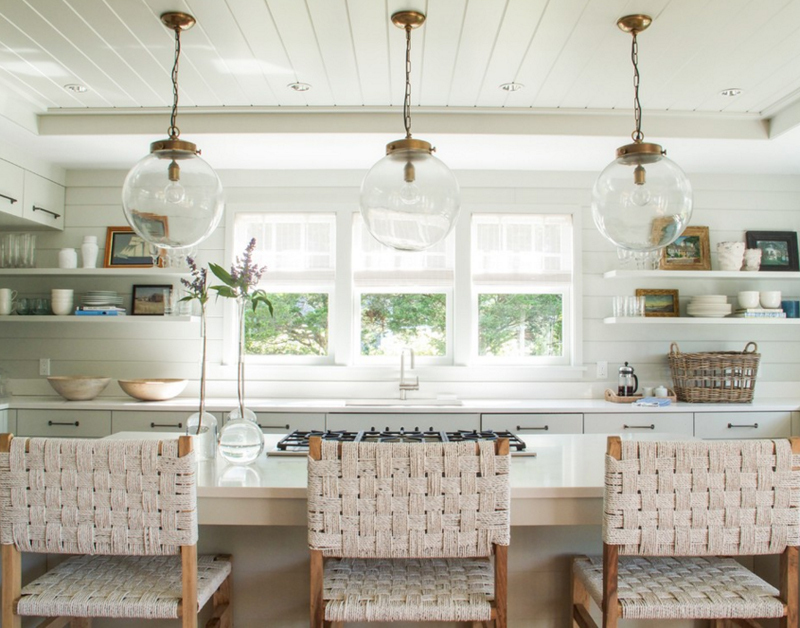 Below is a small list of 20 Charming Vintage Lighting Over Kitchen Table that I think you will surely love, take a look and see for yourself. This shabby chic kitchen is one of my favorite kitchens in this list. 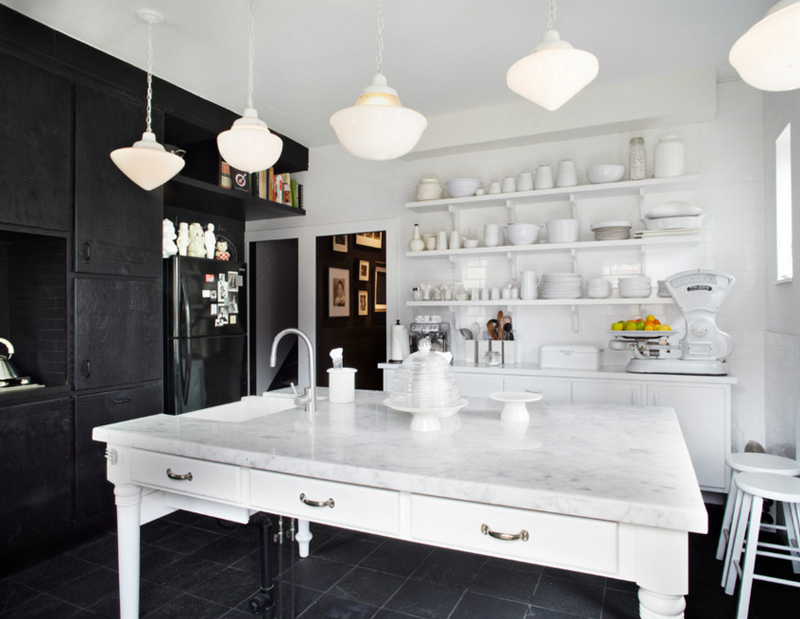 The color is definitely a plus – black and white combo that always go well with each other and adding those cute and vintage pendant lamps created a more sophisticated and dramatic. 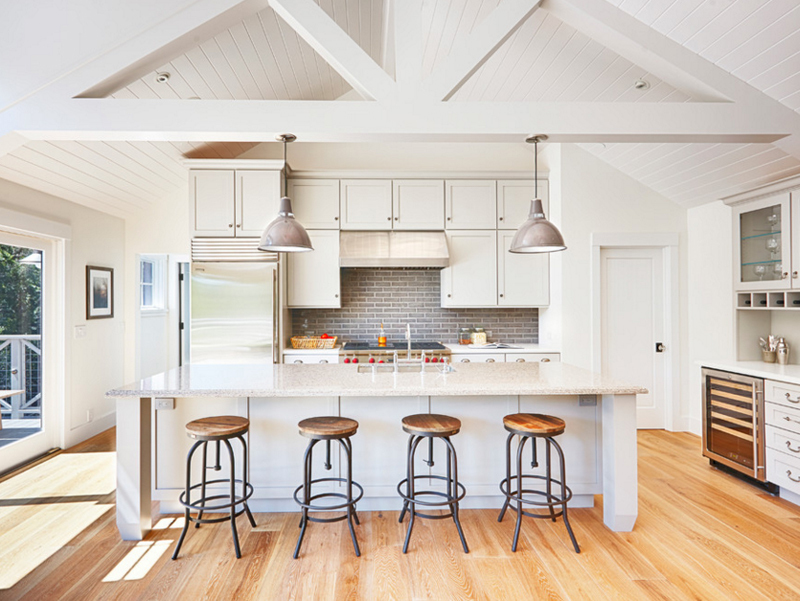 This is one lovely kitchen and maybe the most beautiful thing in here is the pendant lamps but as we clearly see, the colors of the cabinets is just as lovely. The cute windows in here bring in the much needed lighting for this kitchen. 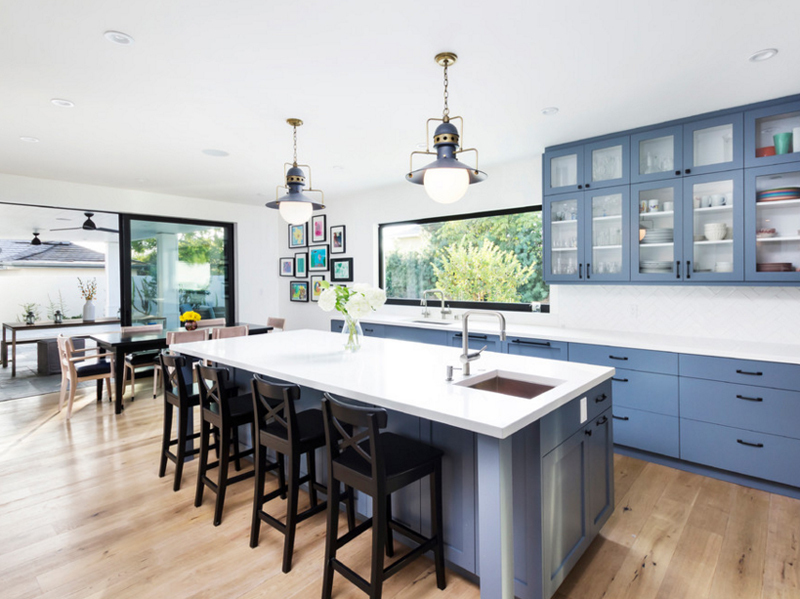 Vintage pendant lights are somehow related to the industrial-type pendant lights because of designers and home owners are incorporating old lighting fixture designs to the modern day homes. 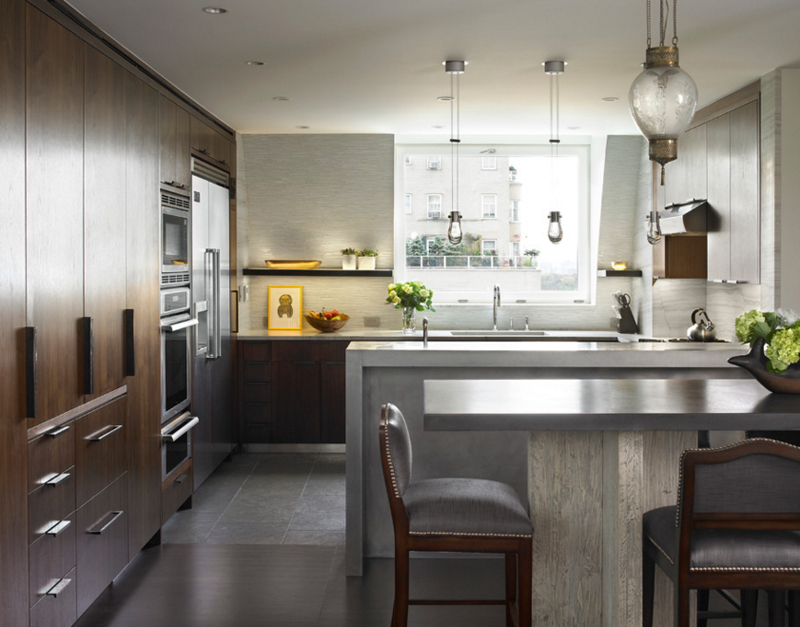 The pendant light in this kitchen for example has an old design but adding it to this space works because of all the stainless materials inside it – I mean, it actually works out for the best of the space. This bubble-looking pendant lights are something people would easily love because it looks so refreshing. Even when you look at it and think that the design somehow resembles something from the past, you know that adding a vintage feature in your kitchen will add more value to it – remarkably! These inverted vase look-alikes are just astonishing! 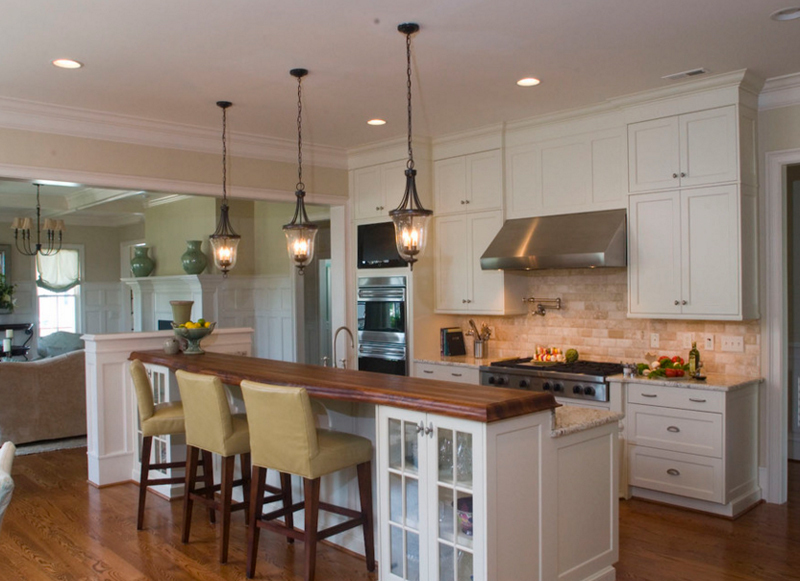 Two are used as pendant lamps above the kitchen bar and the other two is used above the kitchen counters. 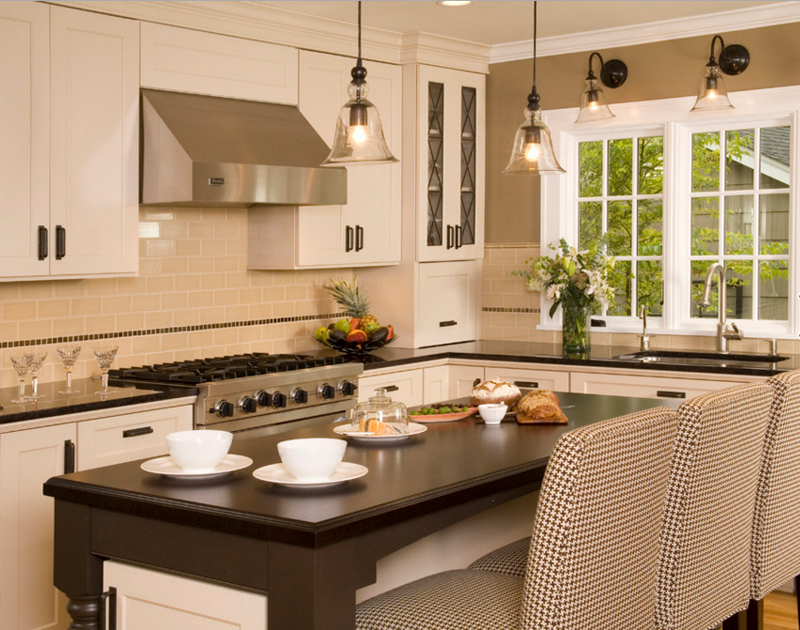 The design of these lamps are neat and complements well with the color palette used in this kitchen. When I saw these pendant lamps, I remembered a pitcher plant. In our province, there is this small farm that grows pitcher plants; I am not sure what other use or purpose the plant has, but I know that the plants are rather appealing and interesting – just like the vintage lamps in this kitchen! According to name of this space – this is today’s vintage farmhouse. 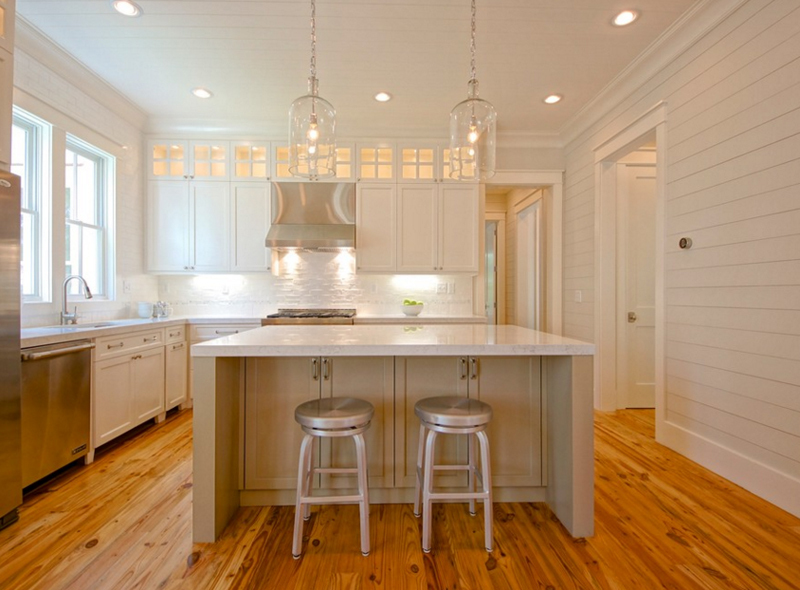 The main color of white and brown works well for this space – it looks clean and really tidy and well-maintained. The lamps are gorgeous and the stools are real stunning too! The simple-looking vintage lamps in this Tunbridge home are quite interesting in a way – because even when it is simple, its appeal is amazing. Its design is quite making it blend well with the kitchen while it is actually standing out! Its color and design is coherent with the entire design of this kitchen space. The Danalda residence’s kitchen is really beautiful. Am I right? The color of the cabinets is not something that you see every day, it makes it rather stunning. If you notice, the color of the body of the vintage pendant lamp is a bit similar to that of the cabinets – pretty cool, right? Talk about coherence and blending. Isn’t it rare that we see small pendant lamps in the kitchen area? This is not because we need too much light that designers or home owners go for the medium to large sizes; in fact, this is because they want to make a statement, a bold one – because evidently, it’s the first thing that you’ll see when you enter the kitchen, might as well get the biggest one possible – both for show and function. There are two unique individual pendant lamps in this kitchen. Both of course have a vintage style – that is in fact interesting and refreshing! This type of styles is rare and not always the ones that you see people pick out in hardware stores or lighting supplies. I like the thought the designer really added a fixture above the areas where light was really needed – atop the sink and the range and oven. A 1980’s home that is blessed with a wonderful design and aura. 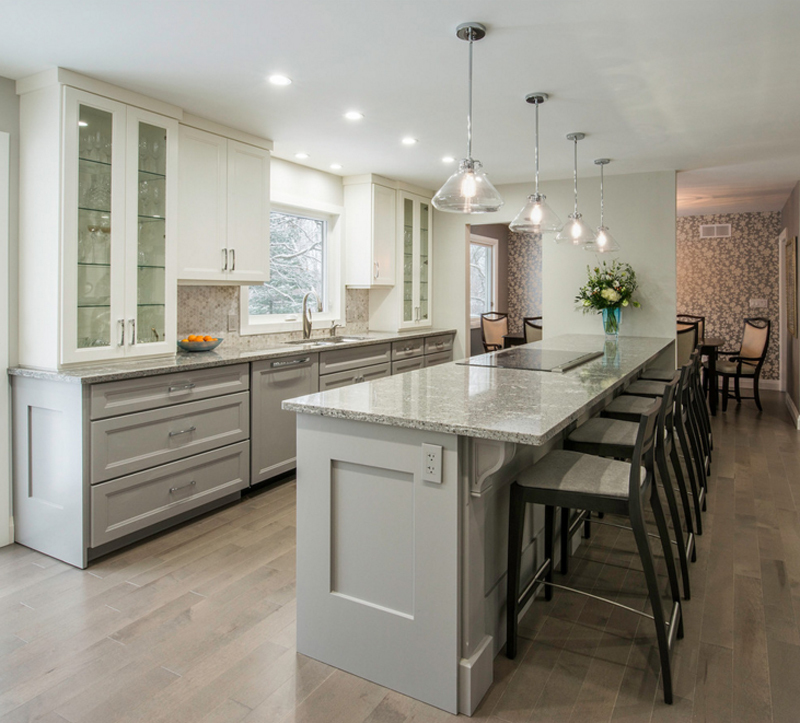 This Toronto kitchen is indeed a gem! The design of this space is really beautiful and neat – neat, meaning that it sure has clean lines, functional spaces and well though traffic flow. 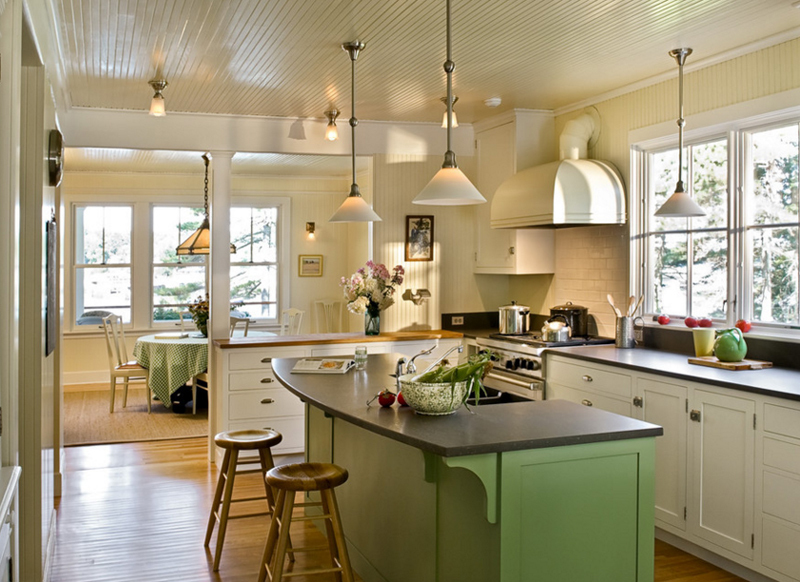 Let us take note on the wonderful choices of kitchen stools and vintage lighting fixtures. A Boston kitchen with a vintage pendant light similar to the one above I mentioned that somehow resemble the pitcher plants, only this time, the steel linings and cables are not black the first ones. 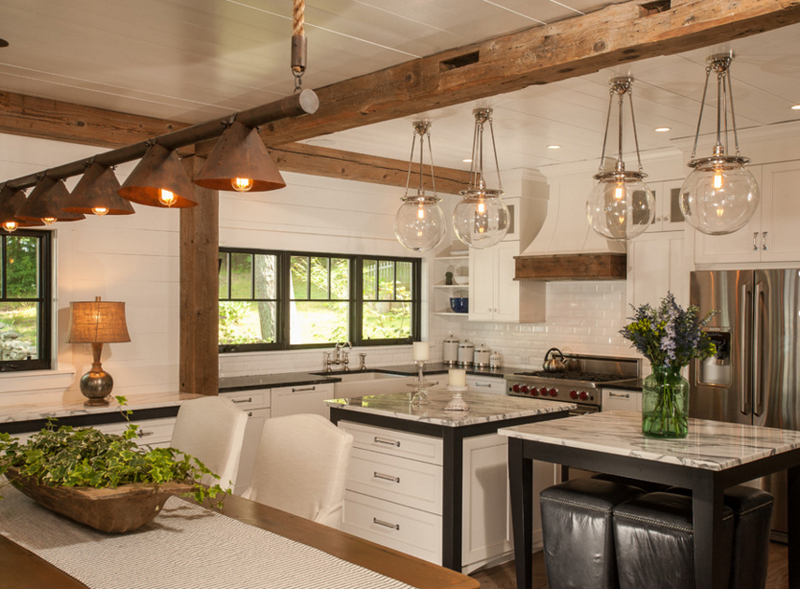 This lighting fixture is perfect for this space because it is bright and sunshiny. Is there even a word like that? Still, I think this kitchen is lovely! I know that this penthouse kitchen has a single vintage lamp above the kitchen island – very unusual, but since this kitchen is actually small, I think the light is just enough. Also, I added this picture in this list because of the very original looking lamp this one is – the details are superb, I love it! Notice how these vintage lamps resemble an inverted rose? I learned from my best friends’ cousin that in preserving roses, you should hang them upside down so as to make sure that the petals won’t fall off and the shape of the flower would stay intact. The design and look of this lamp is somehow similar to that concept. Can you remember the cover of the rose Beast was keeping in a room in his mansion in Beauty and the Beast? The design and shape of these vintage pendants lights are almost the same with that cover in that story. 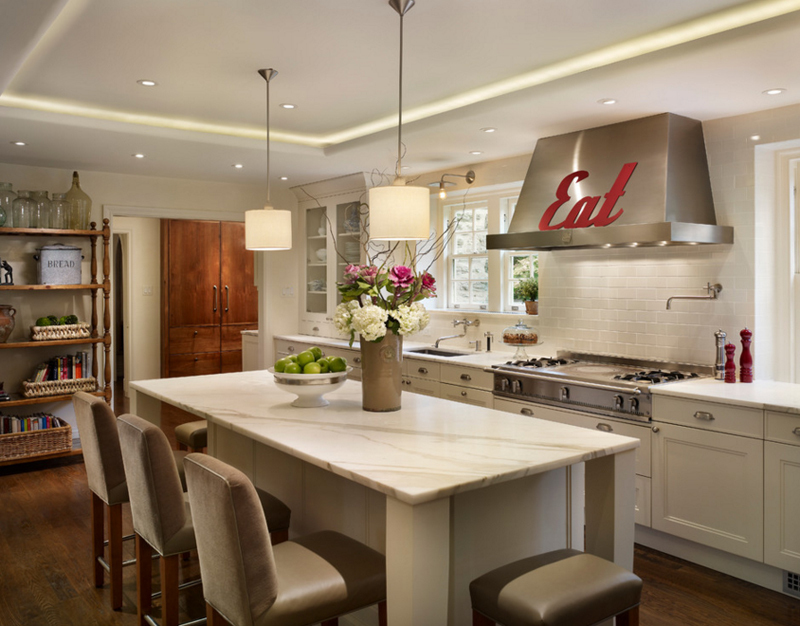 It’s made from clear and clean glass that also covers a bulb that is used to lighten up this beautiful kitchen. This Prairie styled kitchen is really pretty. It has tons of space that is great for traffic flow. If this was our kitchen in our house, I think that parties and get together would not be a problem because of how wide this space is for entertaining and feeding guests. Globe pendant lamps are so pretty! They look like hardened bubbles that give off light which is never a bad thing, right? The design may look simple and maybe even odd, but will always be a conversation topic, you and your friends can have whenever they come to visit – pretty much a topic for small talk, right? Haha. 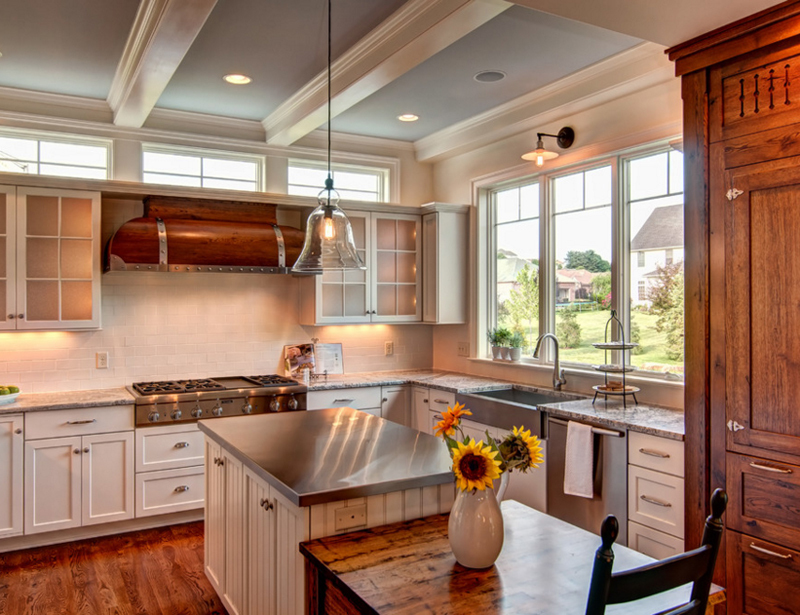 Here is another kitchen that has a single pendant lamp for its island. Of course, that’s okay – because that is only what is needed and necessary. It seems that this kitchen is already lit up with other recessed lighting; so, this kitchen is actually good to go. I just wanted you guys to see the design that it has – a see-through bell that looks really beautiful against all the whites and grays and browns in this kitchen. Last, but definitely the least – a beautiful cottage designed by Whitten Architects. 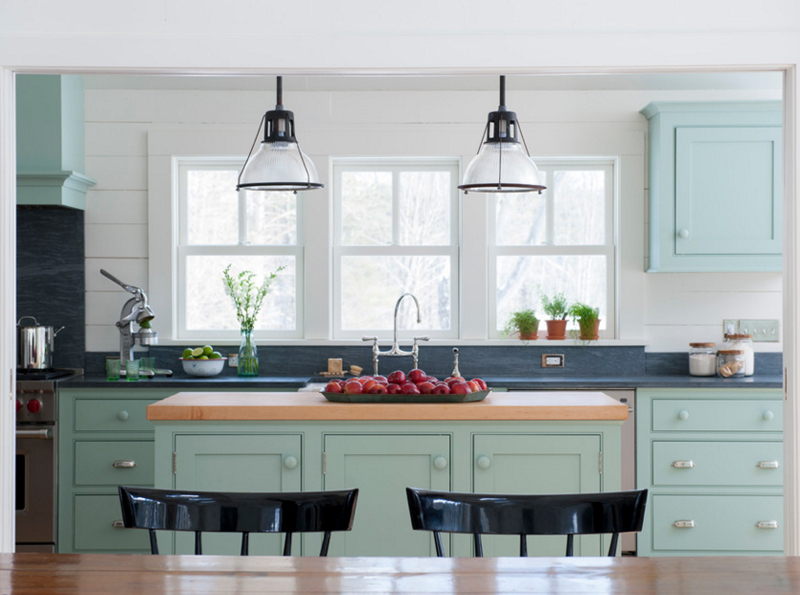 The color palette is so charming, I just want to live in here – plus the cabinets are stunning! Heck, even the simple stools look pretty! Notice how this home is using vintage triangular pendant lamps! Even in the dining area; pretty much a neat idea to really coordinate the fixtures in the house. There you have it ladies and gentlemen! 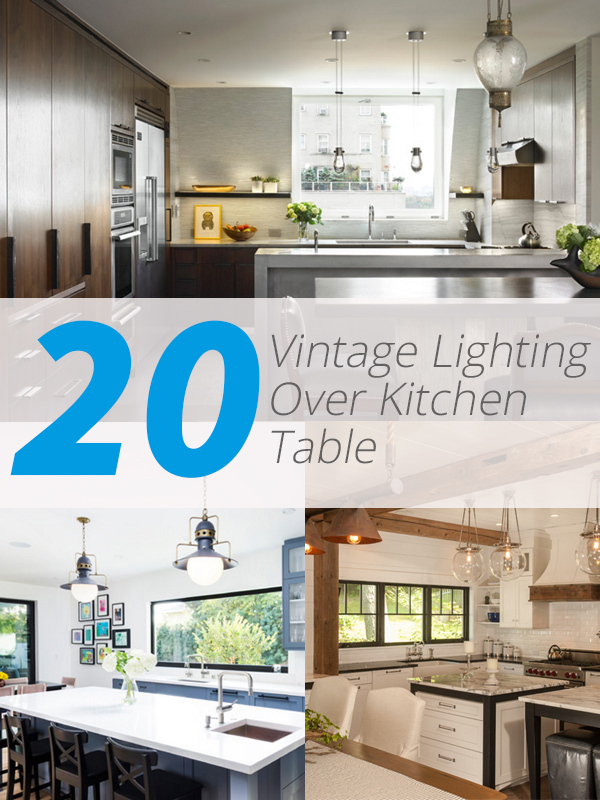 A list about 20 Charming Vintage Lighting Over Kitchen Table. This list is one fascinating list for me since I really like collecting pictures of lighting fixtures – like furniture, lighting fixtures is evolving every day and I can’t wait for what’s coming next. 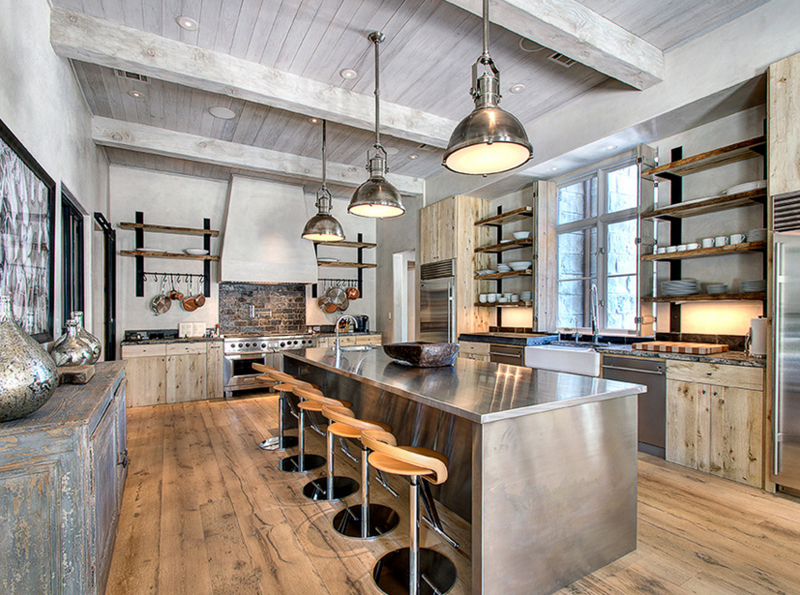 I hope that you liked this list just like the 20 Industrial Lighting Over Kitchen Table. More to come in Home Design Lover!